HCM CITY — Photographer and RMIT Vietnam lecturer Simon Richards has visually documented the hidden art of typography and hand-painted Vietnamese signs in Hoàn Kiếm District, an area in Hà Nội rich with cultural heritage and history. As an old trading hub, Hoàn Kiếm District still clings to its past, from the tight streets and preserved narrow shop fronts to the bustling markets. “Hanoians are very proud of their heritage. The [Hoàn Kiếm] area is protected by a special group of urban planners, architects and families called Hà Nội Heritage,” Richards said. He described the district as a “real walking museum, street by street, featuring Vietnamese history for everyone to see”. He said that it had been difficult to find the hand-painted signs hidden in the noise and chaos of Hà Nội’s Old Quarter. “My initial research was looking at sign writers and once my team and I started talking to people, we realised they wanted to share their stories. Some of the signs we found were more than 70 years old, and some were 40 years old but actually looked 100. “Because [Hoàn Kiếm] was an old trading hub, there’s a diverse range of typography styles taken from the French and Chinese, and a mixture of different languages and dialects that still exists, but they were hard to see because most of the signs had faded,” he said. 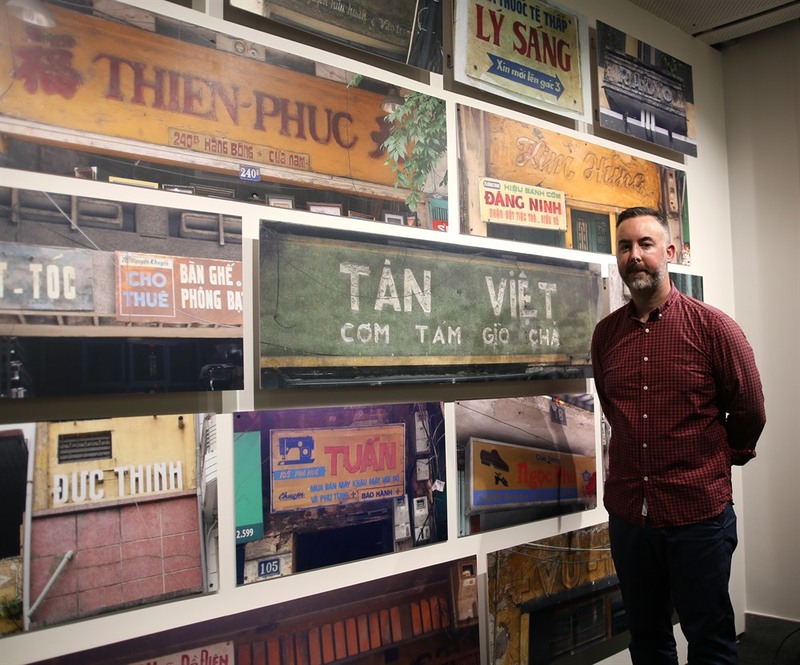 By photographing the signs and connecting their stories, Richards discovered a renewed appreciation for the art, noting that several Instagram accounts are documenting old signage and typography throughout Việt Nam. Through research, Richards and his team discovered many types of handmade signs, ranging from woodcarvings and concrete mouldings to ironwork and plastic lightboxes. He is expanding his study to Sài Gòn, which is home to a dwindling series of hand-painted signs and unique typography. “Phase two is talking to the artists. The long vision of that is a documentary of artists discussing what these signs exactly mean. It’s not like you can go into a library and find this stuff,” he said. Richards’ research is part of a larger exhibition, Dấu ấn thời gian (Sign of the Times) currently on display at Lygon Gallery on RMIT Vietnam’s Saigon South campus. Sign of the Times also presents the research and practice of Andrew Stiff, who focuses on event movement and space in the hẻm (alleys) of District 4 in HCM City. These two research projects recognise and celebrate aspects of Vietnamese culture that are extraordinary in their ordinariness. Both investigations have been collated into two distinct archives developed in collaboration with RMIT Vietnam University Library.